​For dry/very dry skin. Highly recommended for mature skin. This face moisturiser for dry skin is a nourishing, moisturising, regenerating, calming and anti-oxidant face cream (Not suitable for combination, rosacea and acne conditions.) This face cream can be used as a day or night facial moisturiser. Some women prefer to use only at night. Based on cold-pressed extra virgin Spanish olive oil. Containing Rosa Canina flower extract well-known for its rejuvenating and anti-oxidant properties and scented with Organic Palmarose essential oil, which gives a beautiful aroma. A supreme long lasting experience for your skin, the environment and your senses. Plumps your skin naturally ! 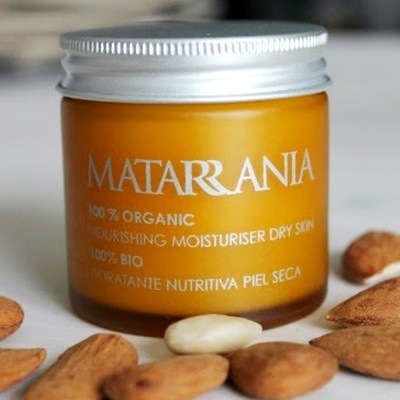 As MATARRANIA do not contain WATER it will take slightly longer to absorb than conventional water based cosmetics but the result is spectacular on dry/very dry skin. To get the excellent benefits from this facial moisturiser apply a small amount and massage throughly until absorbed. Add more if needed. MATARRANIA is an exclusive range of cosmetics made in Spain, from 100% Organic Extra Virgin Olive Oil, which protects and cares for your skin. All the cosmetics are uniquely water free meaning its powerful ingredients are not diluted resulting in a more sumptuous, rich and slow absorption into the skin. We invite you to massage, pamper your skin and enjoy these natural handmade skincare products. Ingredients INCI: Olea europaea (Olive) Fruit Oil* and Rosa canina (Wild Rose) Flower Extract*, Prunus amygdalus dulcis (Almond) Oil*, Helianthus annuus (Sunflower) Seed Oil*, Sesamum indicum (Sesame) Oil*, Cera alba (Beeswax)*, Cymbopogon martini (Palmarose) Oil*. * from organic farming (100% ingredients) Contains: Linalool, Geraniol, Farnesol. Natural constituents of essential oils listed.